My 1-2-3 Cents : A New Era or SSDD? In case you're wondering SSDD is Same Stuff (this is a PG blog) Different Day. Monday, July 18, 2011 may very well have marked the start of a new era in the wrestling (sports entertainment) business. I say may have because I want to see what happens in the coming weeks with the "future endeavouring" of WWE CEO Vincent Kennedy McMahon. We all know the real life story of the McMahon clan by now. Triple H is Vince's son in law and for years there has been talk of him taking over the reigns when Vince decided to hang it up for good. As of right now, the WWE Corporate site has not mentioned any change in leadership within the company. That being said, I tend to believe that Triple H will merely become a figure head character on TV. Hopefully this will result in the termination of the Anonymous Raw General Manger. 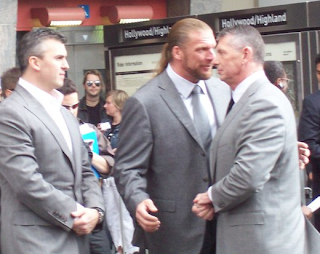 In all likelihood, Triple H is being groomed by Vince to one day take over. 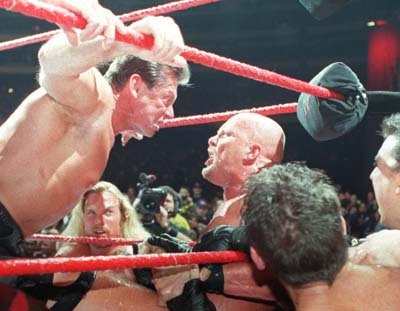 I just can't see McMahon ever truly retiring, at least not yet. I like how they tied in the CM Punk-John Cena angle to launch this potential new era. I really hope the that the focus is not taken off of this storyline. Technically right now, CM Punk is STILL the WWE champion. I don't ever remember saying Punk was stripped of the title. He just said there would be a tournament to crown a new champ and we saw how that ended. Storyline wise, I don't see Triple H rehiring Punk either though. After all he insulted the entire McMahon family including the "doofus son-in-law". Would it make sense for H to bring Punk back? I must say this is the most compelling storyline the WWE has done in a long time. They need to let this simmer and not rush it like they did the Nexus creation. Let's face it, this is the best the WWE has done in a long time. Even the company's worst critics would agree with that. I've always liked the evil Mr. McMahon character. But he has gotten stale, so it's a good thing he's going away again. I would have liked to seen where his "exploding limo" angle was going to go four years ago. Maybe this will be the angle to one up that one. I'm also going to wait to judge Triple H. He's a great performer. Not one of my favorites by any means, but I respect what he does in the ring. Now we need to see what he can do in the office. Again, I don't think he's in total control, but like it or not, one day he will be. So was July 18th a true "game changer"? Only time will tell. Weigh in here or on Facebook, Twitter, or YouTube.